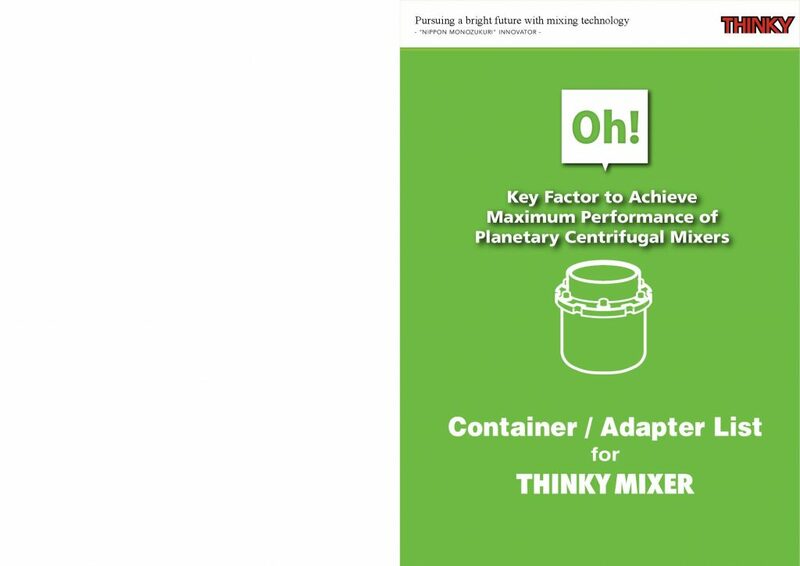 THINKY Mixers are industrial non-contact “planetary” mixers for all engineering compounds. They mix, disperse and degas your materials in seconds to minutes, in a sealed or lid-less container such as a jar, beaker, syringe tube or cartridge. The non-contact mixing principle makes it possible to formulate or combine compounds from very small amounts such as 0.5ml to large production scales. THINKY Mixers are industrial non-contact “planetary” mixers for all liquids, pastes, powders and fillers – and any combination of these. This includes engineering compounds, pharmaceutical or cosmetic formulations, and nano-particle dispersions. They mix, disperse and degas your materials in seconds to minutes, in a sealed or lid-less container such as a jar, beaker, syringe tube or cartridge. The non-contact mixing principle makes it possible to formulate or combine compounds from very small amounts such as 0.5ml to large production scales. By means of both rotation and revolution of the material in a container, materials are mixed and degassed. The materials are under an acceleration of 400G, and even materials of very high viscosity can be mixed and deaerated or degassed at the same time. The material container revolves and rotates in a planetary manner at high speeds. Centrifugal force presses the material outwards to the inner wall of the container. Other forces cause the material to move downwards in a spiraling direction along the slope of container wall. The material then moves back to the centre of the container and up to the top. As a result, material circulation from top to the bottom generates kneading effects, forcing trapped air out of the material. The THINKY mixer is designed to create more than 400G of force. The THINKY ARM-310 engineering compounds mixer provides consistent mixing results with simple operation and no mixing implements to clean. The THINKY ARE-250 mixing and degassing machine is an industrial non-contact “planetary” mixer for all engineering compounds. It mixes, disperses and degasses up to 310g of material in seconds to minutes, in a sealed or lid-less container such as a jar, beaker, syringe tube or cartridge. The THINKY ARV-310 is an industrial non-contact “planetary” mixer for all engineering compounds. This vacuum degassing machine mixes, disperses and degasses up to 310g of material to high levels in seconds to minutes, removing any micro-bubbles using an integral vacuum function. The THINKY ARE-400Twin Mixer is an industrial non-contact “planetary” centrifugal mixer for all engineering compounds. It mixes, disperses and degasses up to 500ml/800g of material (gross) in seconds to minutes, in a sealed or lid-less container such as a jar, beaker, syringe tube or cartridge. The THINKY ARE-500 Mixer is an industrial non-contact planetary centrifugal mixer for all engineering compounds, with a maximum capacity of 500ml or 1.1kg. It mixes, disperses and degasses your materials in seconds to minutes, in a sealed or lid-less container such as a jar, beaker, syringe tube or cartridge. The THINKY ARV-930Twin Mixer makes it possible to mix, disperse and degassing at the same time. This product employs a twin planetary centrifugal mixer system, and supports manufacturing application with the capacity to process a maximum 1 litre of materials. The THINKY ARV-5000 is an industrial non-contact “planetary” mixer for the centrifugal vacuum mixing of all engineering compounds. It mixes, disperses and degasses your materials in seconds to minutes, in a sealed or lid-less container such as a jar, beaker, syringe tube or cartridge. The ARV-5000 holds up to a 5000g material container. This 20L capacity THINKY mixing, vacuum and degassing machine for production is capable of achieving the performance of THINKY laboratory models such as THI ARV-310 but on a larger scale to support a mass production process. 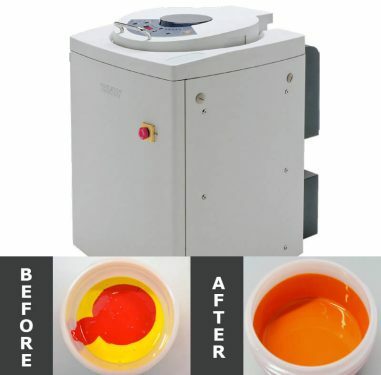 By revolving the container at a high speed and rotating at the same time, the SR-500 Solder Paste Mixer and Conditioner generates powerful acceleration and convection currents, and carries out mixing and degassing simultaneously. Solder powder that settled during storage is uniformly dispersed and returns to a near factory-delivered, high quality state.